The Evergreen Cooperatives of Cleveland, Ohio are pioneering innovative models of job creation, wealth building, and sustainability. Evergreen’s employee-owned, for-profit companies are based locally and hire locally. We create meaningful green jobs and keep precious financial resources within our community. Our workers earn a living wage and build equity in their firms as owners of the business. The first Evergreen Cooperative businesses – Evergreen Cooperative Laundry, Ohio Cooperative Solar, and Green City Growers Cooperative – are launching in 2009–2010. 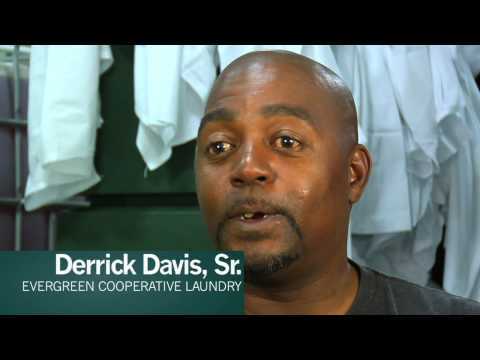 The vision of Evergreen Cooperative Laundry is to advance green initiatives in the healthcare industry by helping our customers to reduce operating costs, lighten their carbon footprint and invest in local community development. Our “owners” receive superior training in operations, life-skills, sustainability and ownership principles empowering their performance at work. Studies have proven that employee ownership and participation yield substantial improvements in overall performance (data from the Ohio Employee Ownership Center of Kent State Univesity, Kent, Ohio). By participating with us in the region’s first LEED certified commercial laundry facility you will be able to cut your operating costs and eliminate a major source of water and energy inefficiencies, reduce the use of toxic chemicals and eliminate hazardous waste from your facility. Evergreen is a partnership between the residents of six of our city’s neighborhoods and some of Cleveland’s most important “anchor institutions” – the Cleveland Foundation, the City of Cleveland, Case Western Reserve University, the Cleveland Clinic, University Hospitals, and many others. Help us build community wealth to transform Cleveland and change lives.